Traditional MTB Night Race will this year be held on FRIDAY evening, this time under patronation of our new partner ROBE. It's that kind of a race that you can push hard from start to finish; or rather enjoy it in the training tempo, but with maximum fun! The race takes place on lightened biathlon tracks and many participants often start in bizarre costumes and show off some truly amazing stunts. But there are also some guys, who take it 100% seriously: the front of the pack is pushing it full throttle! Don't hesitate to take part even if you want to take it relaxed and without a costume, you definitely won't be alone out there! The race circuit is over 3 km long with wide and paved surface. The race is held for 40 minutes + 1 lap. At the start line you will meet World Cup team mechanics and other team members including even the Team Managers of renowned names. MTB Night Race is definitely something you should't miss! And if you don't participate as an athlete, a role of spectator is a must! Riders registered in advance will be preferred. The race takes place on lightened biathlon tracks. One lap is 3 km long. The race lasts 40 minutes + 1 lap. Plan of the race track below on this site. The start „introductory“ lap = all riders behind the motorcycle. Regardless of the riders’ category and club membership, three-member teams can be registered. The absolute ranking of the teams is evaluated. The team riders’ two best results are counted in the overall team result. The first wave of 50 riders will have a prioritized position on the start grid. Prioritized riders will be chosen by the organizer. All remaining riders will order in the start area upon their arrival and the instructions of race marshalls. Prioritized position on the start grid may be required only with the online registration until May 21 and must be accompanied with a proper clarification of riders’ good shape. We recommend to all riders: if you don’t need to take each race 100% professionally, do not ask for the prioritized position and enjoy the relaxed atmosphere and a huge portion of fun in this race even with a normal „as you come“ starting position. On-line payments are also processed for the organizer via SportSoft, spol. s r.o. It is possible to cancel your registration until May 21, 2018 by email to the Race Director. Cancellation fee of 3 EUR applies. Cancellations after May 21 will not be accepted. Competitor shall place a start number on the front of his bike and keep it visible for the entire race. The start number is assigned only for this particular race. There's a chip for timekeeping glued to the start number. The start numbers will not be returned after the race ends, nor the chips. Under the grandstand in Vysočina Arena. The awards ceremony will take place on the WC podium in Vysočina Arena directly after the race. Each participant must behave not to endanger health of other participants nor their own. 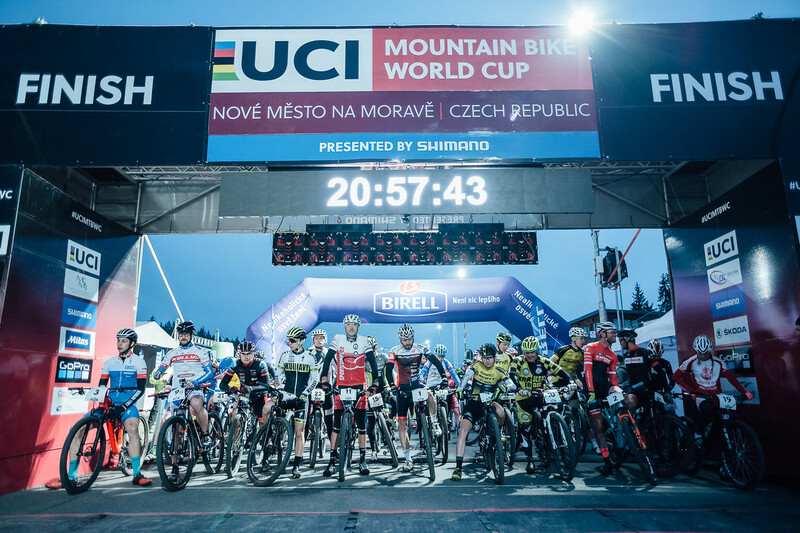 Mountain biking is a demanding sport and each participant should seriously consider their readiness before the start of the race. Full protective helmet is mandatory!!! It is strictly forbidden to use an e-bike. All riders start at their own risk! Participants younger than 18 compete at responsibility of their parents or team coaches. They will present their signed agreement at packet pick up at latest. When cancelling the race due to sudden natural disasters, epidemics or the worsening security situation in the country the starting fees will not be returned. Night Race = all about fun!